There you have it ladies and gentlemen. You can all relax now. Unfortunately, that does put a damper on some "Star Wars Detours" plans, but I'd be willing to wait on that series, at the risk of Star Wars "overload". 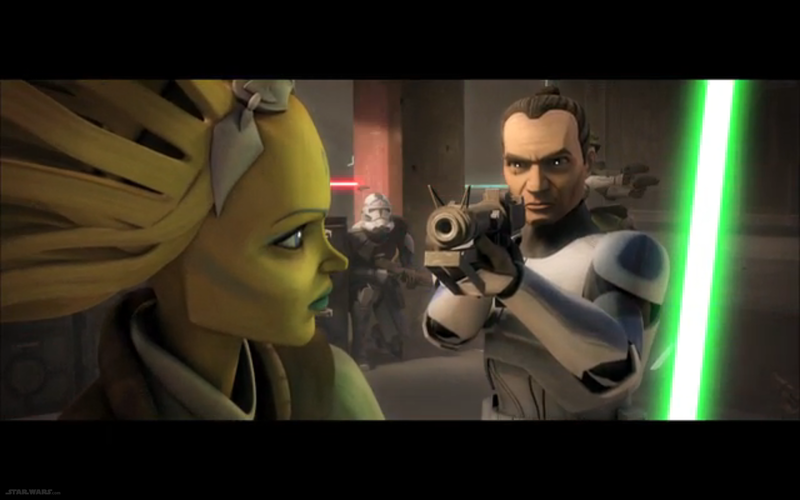 Be sure to check out Supervising Director, Dave Filoni, has to say about the future of The Clone Wars. And be sure to check out this incredible clip from the once named "Season 6"! -Admiral Trench is back, and he is pretty f'd up. -Tup straight up murders a Jedi! After two seasons, we finally get to see Admiral Trench and how his last encounter with Anakin Skywalker messed him up forever. I love the cybernetic robot feel. If the spider-vibe wasn't enough to freak people out, how about a robot spider? Also, could Tup's "Good soldiers follow orders..." be a pre-Order 66 trance? Although I would love to see where they go with that, I have never been a fan of the theory that the clones were "programmed" to subconsciously follow that order. I was under the belief that it was just a military order saying "The Jedi have tried to take over. Stop them at all costs". Regardless, we have official confirmation. So to all of you with your letters, and your petitions, I appreciate the effort but you can stop now.